Internally Threaded Body Jewellery Spare Parts, Balls and Attachments 1.2m - 16 gauge. 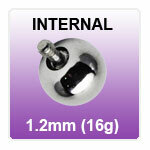 A range of replacement parts and spares for internally threaded 16g body piercing jewellery. Replacement balls, jewels, spikes, cones and other screw on attachments for eyebrow bars and facial labrets.